One of the perks of running a bike shop is meeting all kinds of crazy awesome people! Trust us, cyclists are awesome! 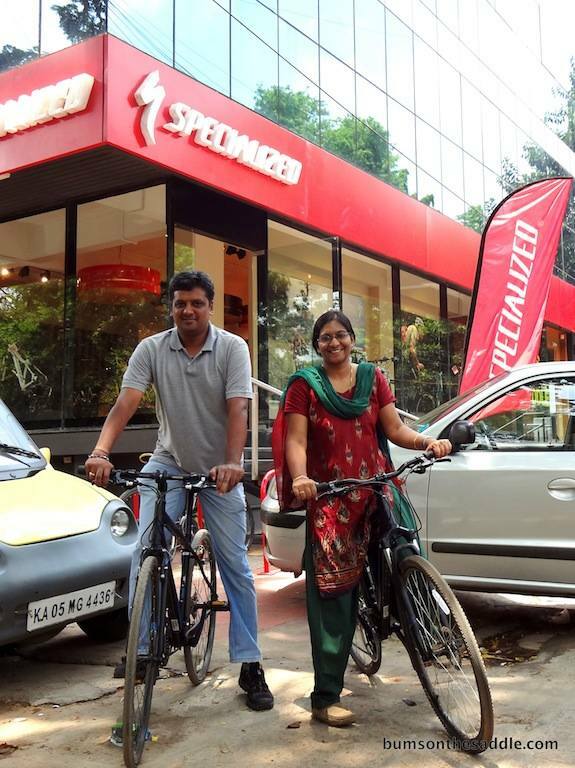 “The Cyclist” – is a series of writeup’s on some of these bikers who inspire the heck out of us! Q: Why are you riding a bicycle when there are easier modes of transport available? I live in JP Nagar 7th Phase and work in Domlur. It is about 15Kms one way. I have three main reasons to switch to bicycle despite having a four wheeler and two wheeler. First and foremost reason: I have a very sedentary life style and very less time to spare for exercise. I took to cycling as the primary exercise outlet as it provides a good workout. Second: I actually SAVE TIME in traveling. It is true. I save 10-20% of the time when traveling to work by cycle in comparison to two wheeler. Cycling always takes the same amount of time irrespective of traffic conditions. With two/four wheeler it is not the case – commute time increases based on the traffic conditions. There is no added stress due to traffic congestions as I can wheel through smaller spaces. The best thing about a cycle is that you can easily lift it and carry along. Third: With cycle as a primary mode of transport I add zero pollution to the environment. Q2: What do you most enjoy about riding a bicycle? Every thing. Rides are exhilarating. Q3: All the 3 member in your family have a bicycle. 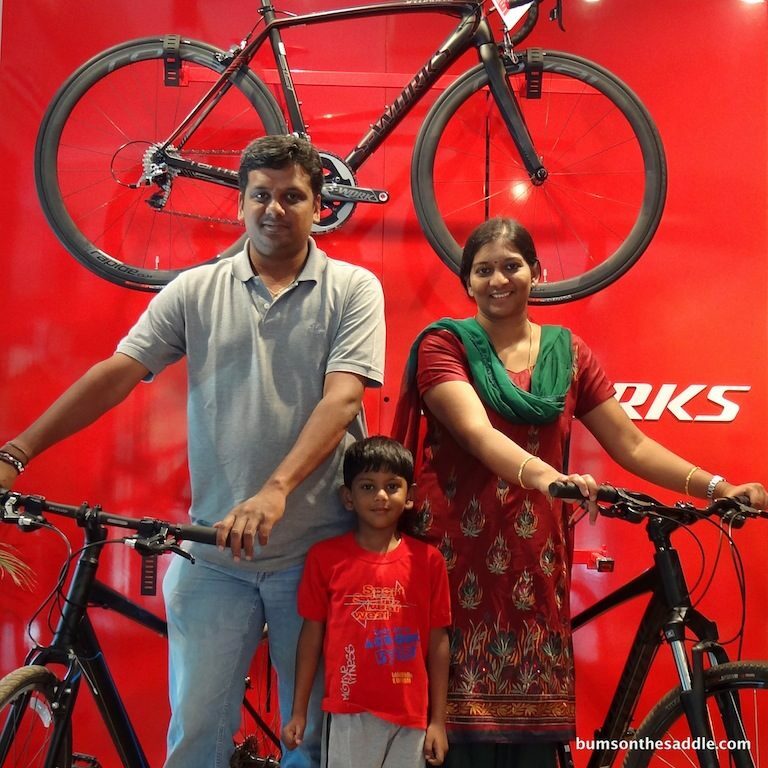 What is your thought when it comes to your wife and son riding a bicycle, with Bangalore considered un-safe for cyclists? All three of us cycle together at night in the basement of our apartment. It is so relaxing and we enjoy every bit. My son is 5 years old and he rides a Firefox bike. He gets so excited to see both of us cycling along with him and shows us his new stunts. My wife cycles to work. Initially when she started to cycle to office she used to call back as soon as she reached her office desk and also immediately after reaching home. I was anxious about her safety. But soon all these fears vanished when I saw her cycling back home relaxed with extreme ease and good speed. I was really surprised as I expected her to be out of breath or sweating profusely as most of it is steep roads. I am now very confident about her ability to cycle. All through I was depended on shuttle service to commute to work as my office was just 3KM away from home and mine was the last pickup point, which worked for me till my son started going to school. His school bus would pick him at 8:30 AM and my office shuttle would leave my stop at 8:40AM. These timings made things difficult. I never wanted to miss saying bye to my son. I had to rush to my office shuttle stop and I started missing the shuttle many times which left me quiet irritated. I had to look for other options to commute – sometimes I would tag along with my husband or had to get an auto. Getting an auto was a challenge in itself. I used to stand for as much as 15 minutes to get an auto and even paid double the meter fare many times. Within couple of days I gained so much confidence that I could comfortable move in peak traffic. I used to reach office in less than 15 minutes in the morning after seeing off my son and reach home by 6PM. Gone are the days waiting for autos. I feel so proud when I am on the bicycle. Q: What is the distance you cover to reach office? Q: How safe do you feel when riding a cycle to work? Q: First timers are worried about sweaty body when they reach office. What do you do to tackle this problem? With the short distance of 3km, there is no much sweat. I wear cottons always and am comfortable. I keep a pair of clothes at office. Q: What message would you like to send out to all women riders, who are in confused state about cycling? Just get on to that bicycle and ride with the wind ladies. Leave all your inhibitions as it is all in the head. Tell yourself that you can ride with ease and will look like a champion on a cycle. Don’t worry about what other people think as a woman riding a bicycle is not a common sight in India. You will be a role model to those in dilemma. After I started biking to work, two of my neighbors started biking too. I now have another lady biker at work too who is inspired by me. Having started cycling quite late in life, I love riding whatever I get my hands-on! I love the sense of accomplishment I get every time I ride my bike and the fact that I feel younger with more saddle time. I enjoy riding my road bike hard on gravel and am looking forward to someday riding The Paris-Roubaix challenge.